The Cardiac Diagnostic Clinic offers on-site diagnostic testing to all of our patients. There are many tests a doctor can request or require when it comes to heart health. On-site testing allows the Cardiac Diagnostic Clinic to give our patients prompt accurate results in a quiet friendly environment. Based on your health history and any new symptoms our physician may decide that testing is required to maintain a healthy lifestyle. Testing offered on-site includes electrocardiograms (ECG), cardiac stress testing, echocardiograms, cardiac stress-echo testing, 24hr Blood Pressure Monitoring and holter monitoring. Each test provides our physician with valuable diagnostic information. Electrocardiograms(ECG) – is a routine test that records your heart rhythm for the doctor. The test takes a few minutes and is very minimally invasive but offers critical information for diagnoses. 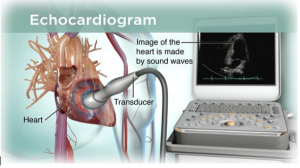 Cardiac Stress or Stress-Echo Testing – a 20-30min test that is minimally invasive. 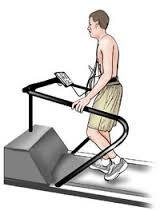 An electrocardiogram is analyzed while the patient walks at increasing intervals on a treadmill until an end point is reached. During stress-echo testing an ultrasound of the heart is performed before and after exercise. Blood pressure and heart rate are monitored throughout testing. Echocardiograms – is an ultrasound of the heart. Gel is applied to the chest while ultrasound pictures are taken of the structure of the heart. 30-45mins. Holter Monitoring – monitoring that collects heart rhythm data over a period of 24hrs-14 days. A small monitor is worn with electrodes placed on the chest. The information collected is analyzed by the physician. Though every test is unique they all are minimally invasive and supply valuable diagnostic information. Any questions or concerns about any of these tests can be easily answered by our physician, knowledgeable staff and technicians. It is our goal at the Cardiac Diagnostic Clinic to provide the best care to all of our patients. All of the testing we provide allows us to offer that care at high levels in a quiet and relaxed environment. We take pride in making testing more comfortable for each individual patient. Let us know of any concerns you may have. We are more than happy to help. Please contact our clinic if you have any questions, concerns or general inquiries. If you are a new patient please contact your family physician or local out patient clinic as a referral is required to be seen in our office.